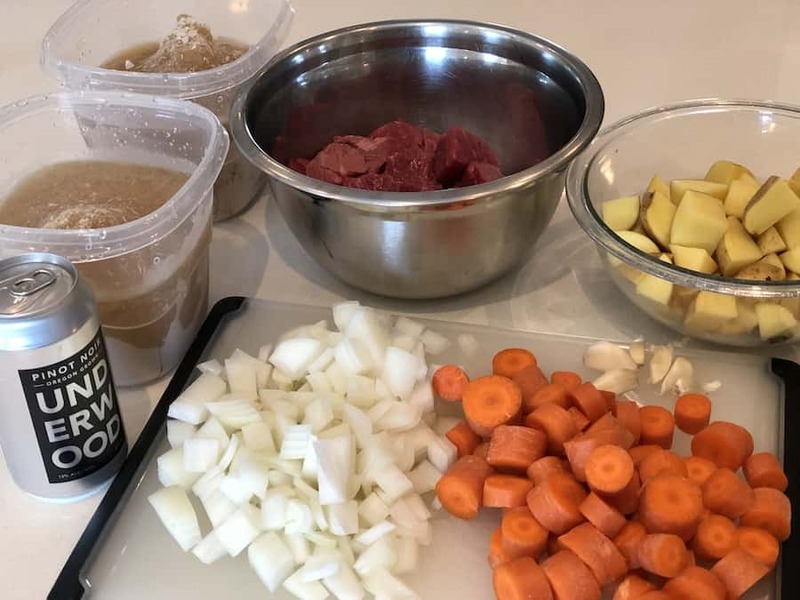 As the weather starts to turn a bit cooler in my neck of the woods, I find that my son starts to remind me on a more regular basis that it’s time for some homemade beef stew to make an appearance on our dinner table. I have no doubt that he would eat stew or chili any time of year, even in the dead of summer. 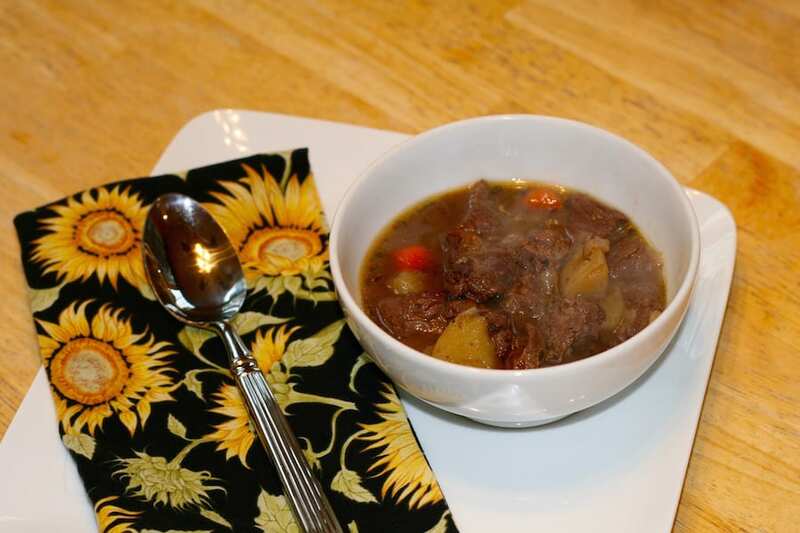 But when falls makes an appearance, when the leaves start to fall, along with the temperature, it just seems like a natural fit in our house to start making some stew. 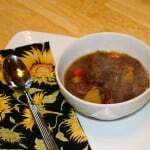 I really can’t believe that I haven’t included this recipe on my website before, after all, I’ve been using this beef stew recipe for years and years, there really is no reason to not include it here. 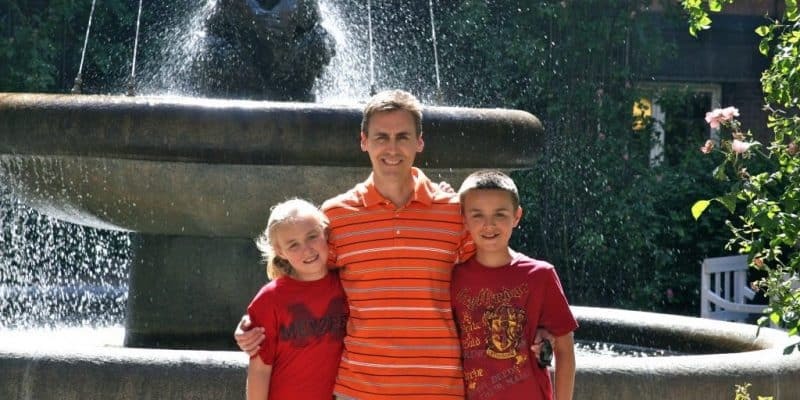 I originally based my efforts on a master beef stew recipe that I found in a Cooks Illustrated cookbook, but have since made a few adjustments to better suit my family’s taste. That, and my total lack of respect for peas, in any form, which the original recipe called for. I normally don’t prep all of my ingredients ahead of time, like the pictures would indicate and like I know I am supposed to, but instead do most of my chopping and dicing while I’m browning the meat. Which, of course, I do cut up into bite sized pieces before cooking. 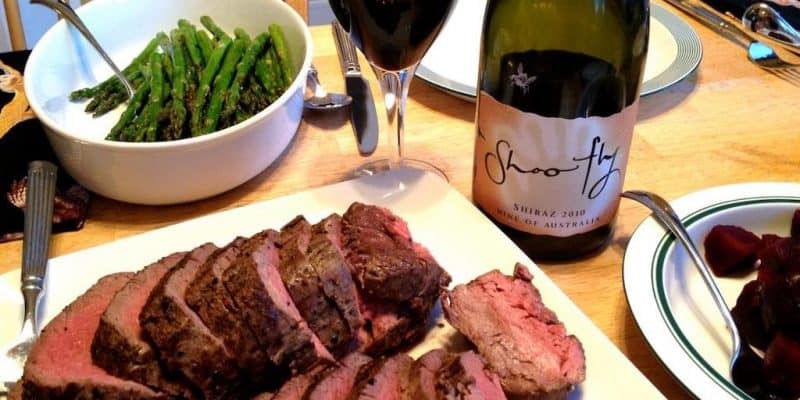 But I’ve found over the years that while the beef is browning that I have enough time to chop up my carrots and onion, press my garlic and measure out my wine and chicken stock. 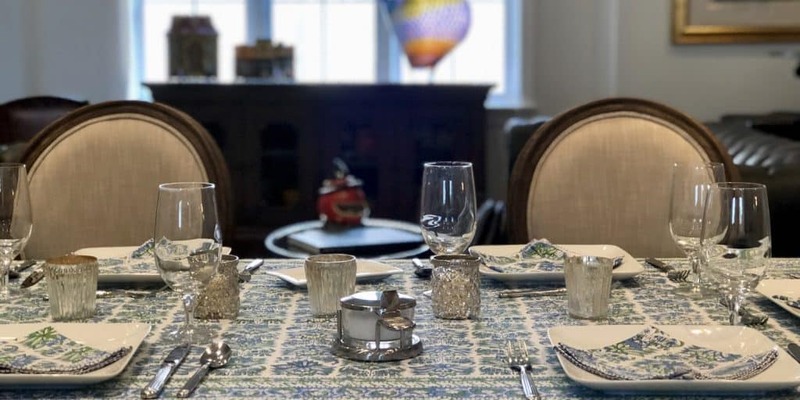 But for the purpose of this blog post, I was a good boy and got my mise en place together so I could take a picture and act like I always do what I’m told. From a nutritional aspect, I can’t find too much wrong with this recipe that I feel needs to be altered or explained away. There’s a fair amount of beef used for this stew, and I suppose the very strict among us would use only grass fed beef. I’d be ok using responsibly raised beef, free from antibiotics and added hormones without having ever lived on a concentrated animal farming operation, if that were my only option. But now that I live in Texas, grass fed beef is pretty easy to find. Even better, it often comes already cut and cubed into stew sized bites for me. Eating grass fed beef, when I can, is both an ethical decision, as well as a health conscious decision. Cows that get to roam and feed like cows are designed to feed tend to also be healthier for us to eat as they pass along many of the benefits of the plants they eat. I guess there’s a bit of gluten in the original recipe, because it calls for a few tablespoons of flour as a thickener. The good news is that if you are trying to avoid gluten, even little amounts like this, you can choose to simply skip this step, or if you prefer, use arrowroot as your thickener of choice. If you opt to use arrowroot, like I usually do, don’t just add it to the stew, but rather mix it in a small container with a bit of hot water, and stir it together to make a slurry. And then add the slurry to your stew towards the end of your cooking time. If you add the arrowroot at the beginning of the process, you’ll actually make it less effective, the thickening properties will diminish over the long cooking time. Lastly, I would be remiss if I did not point out what a great opportunity this is to use homemade stock for your stew. I am sure most recipes call for beef stock when making beef stew, but I very rarely have beef stock on hand. 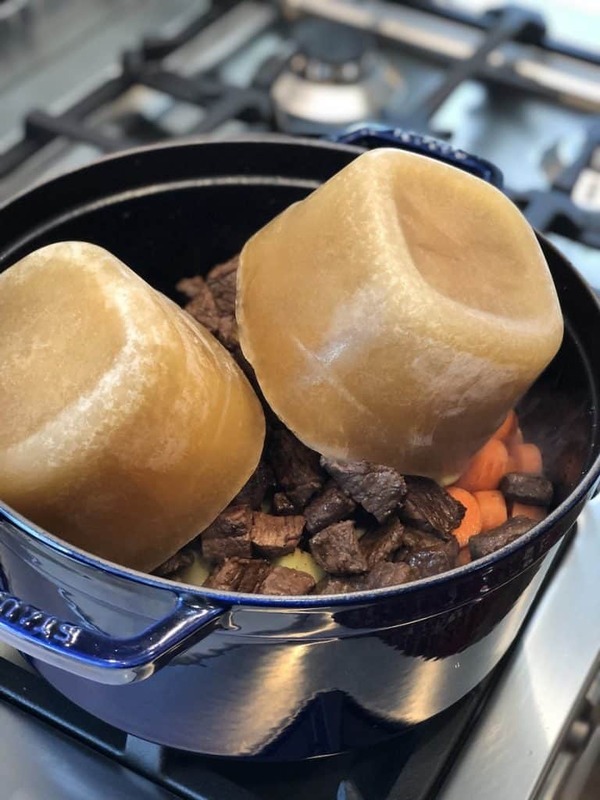 I am much more likely to have chicken stock in the fridge or freezer because I find that it is much more adaptable and works with many more recipes than beef stock does. Homemade stock is such a wonderful addition to any stew or soup, both for the depth of flavor and aroma it brings to the table, and it has all sorts of nutritional benefits! Look it up for yourself, there are articles after articles talking about the health benefits of bone broth. Plus, it has to be better for us than the boxed stuff that sits on shelves in the supermarket for weeks and months, not for me. 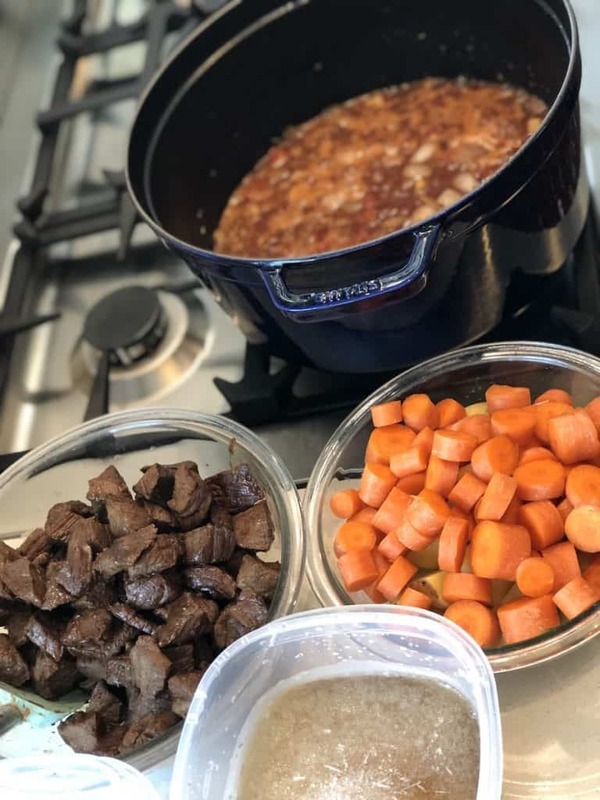 And once again, what follows is a nutrition panel that will not be exact, but rather a guideline for knowing what you are eating when gobbling down some homemade beef stew. 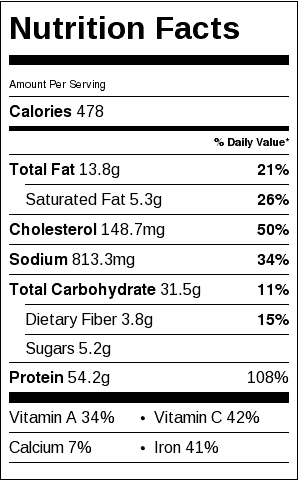 Some of the variables that go into making a nutritional panel like this include trying to guess how much fat everyone trims off their roast before cutting it into little bit sized pieces. And now knowing how big everyone’s potatoes, onion and carrots are, which might have small impact on the overall values. Also, when making homemade stock, there are a zillion recipes, which one did you follow? Will your stock have the same nutritional value as mine? Doubtful. So I did the best I could, found the nutrition values where I could, made some guesses and assumptions, and this is what I ended up with, my homemade beef stew recipe split into eight servings.